Dru Anderson’s life isn’t filled with the typical teen minutiae. 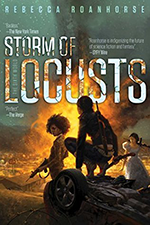 She’s spent her teen years moving from city to city with her dad hunting supernatural creepy-crawlies. She has what her grandma always called “the touch,” a sense for the supernatural. Dru knows when an invisible big bad is around the corner. So, her dad lets her come along on hunts to hand him another clip and warn him of the supernatural baddies in the vicinity. He’s drilled his military training into his teen daughter. She knows the rules, and while she wants to go out hunting with him each night, when he says he’s going it alone, she listens. Dru attends school — but doesn’t really see the point, as they’ll be moving again in a few weeks — and finds an unlikely friend in Graves, the goth boy who sits in front of her during history class. She hadn’t planned to make friends. Usually it’s pointless. But when her dad comes home from hunting as a zombie, Dru’s world flips around. Someone purposely killed him, reanimated him and sent him back home so she’d have to stop him. Freaking out, Graves is her only solace. The guy won’t let her be alone, and you will love him for it. Coping with the loss of her father, Dru uses the skills her father drilled in to stay alive, seek out his killer, find out who is hunting her and maybe find some answers about her mother’s murder. On that journey we have to battle werwulfen, suckers and a giant burning dog. With Graves at her side, Dru isn’t alone but now she has to look out for him, too. Dru has a stony exterior complete with a rough wall built around her. Graves has to force her to open up. She’s a harsher kindred spirit to Vampire Academy’s Rose Hathaway. She’s ready to do battle, to take aim at werewolves and vampires and ghosts and giant cockroaches, but she may not survive it without a support system. There’s quite a bit of world building and heavy subject matter in Strange Angels. We deal with death, loss, uncovering secrets, burgeoning talents and a whole lot of life-or-death decisions. 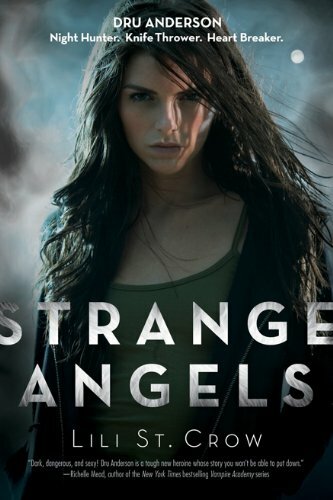 Strange Angels is dark urban fantasy with a young adult tone. If you can handle the heavy topics, diving into Lili St. Crow’s young adult series is a good call. The book sets the stage for a series with the potential to be powerful and imaginative. Sexual content: None, but plenty of violence. This is one of my most favorite book series ever! I always think of it as a female take on the TV show “Supernatural” meets (as you said) “Vampire Academy”. 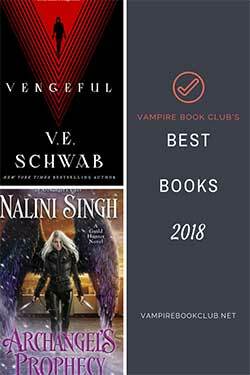 I absolutely love this series~ Great review! Just got this at the airport one day, the Brazilian version ! Now I am anxiously waiting for amazon to deliver the next installments, since it will take longer for the next books to come out in Portuguese !! I guess you’re dead on the comparison: supernatural meets Rose/vampire academy !! How can one not love such combination !?!? The Rose-orphan in me sure did ! LOVE,LOVE,LOVE, this series. Dru & Graves are amazing characters. Dru gets stronger emotionally throughout the series. She is drawn to both lead male character’s. I wouldn’t describe her as more harsh than Rose, she is scared and alone and can’t remember her basics at first but I would say her father has something to do with that. He gives her good info and instincts,but I felt he really didn’t prepare her for the day he might not come home “alive.” The series grows and builds from this book. Dru must learn to deal with secrets about her mother and father. She must also accept her role as a hunter and she seems to become the hunter her father was training. I loved Book 3 “Jealousy.” Book 4 cannot come fast enough. Amazon said it was like Twilight, I disagree tremendously. She was no Bella Swan for me. Glad to see you’re starting this series! It’s a good one!! Just wrote really long post but comp crashed! Argh! To sum it up, Great series, love Dru cause she’s not whiny and supporting characters are not stereotypical YA fodder. Best scene I’m book for me is when Graves finds Dru in the mall at the cafe and buys her lunch. A simple gesture that makes me melt. This is by far one of the best series out there. I am sooo lookig forward to the fourth book in the series I already have it on preorder. The book has come out already, hasnt it?